In Brave, each clan wears a specific design on their clothing as a matter of unity and pride amongst its members. The clothing featuring this design is known as a tartan (don’t get caught uttering the world “plaid,” as the Scots in your midst are ready to pounce on you if you do). 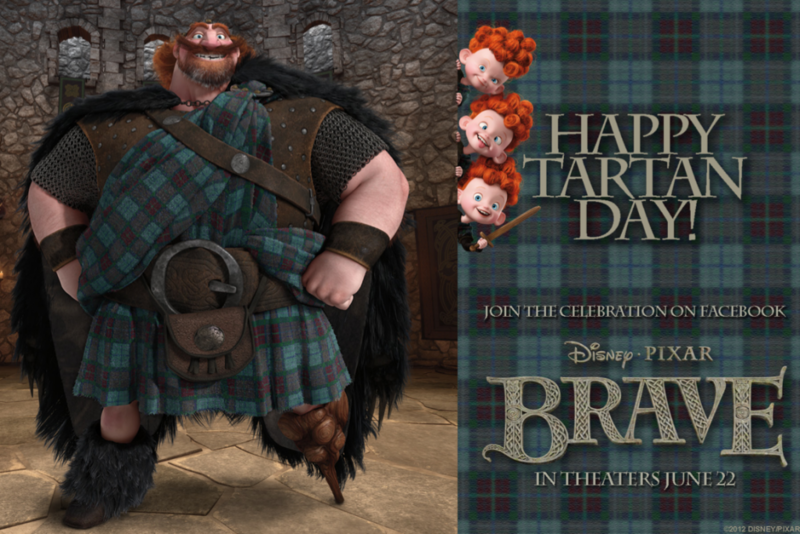 With today being National Tartan Day, Disney/Pixar is celebrating by raising awareness of the holiday. After the jump, check out some cool details about tartans, Brave, and Scottish culture. Observed for the first time in 1997, National Tartan Day celebrates Americans of Scottish descent. April 6, Tartan Day, marks the signing of the Declaration of Arbroath in 1320, which would later serve as inspiration for the Declaration of Independence. As such, everyone is encouraged to honor all things Scottish on this day—history, culture, people, food and—if desired—an upcoming epic adventure that happens to be set in the stunning land. For more, visit the official Facebook page.